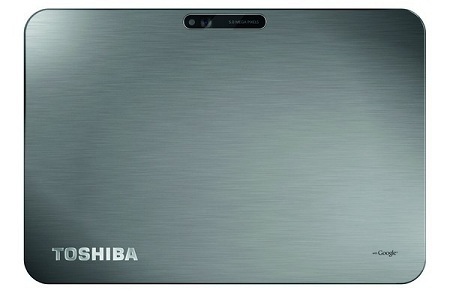 Toshiba Announce AT200 Tablet: Super Ultra Thin! Toshiba have announced their new android tablet at IFA today. The 10.1" tablet will run honeycomb, and be ultra (super ultra actually) thin! 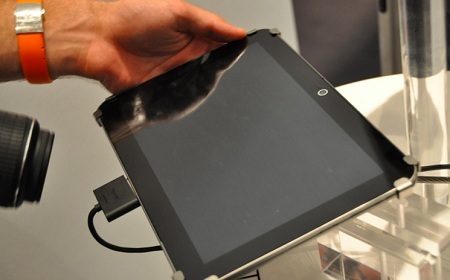 I mean this thing is even thinner than the Galaxy Tab 10.1 (which itself is thinner than the iPad2). That's just crazy to me..
No price or release data at the moment though, but should be here before the year end. Toshiba unveils its world-class, ultra-thin, ultra-light tablet Toshiba AT200 tablet built to exceed expectations at only 7.7mm thin and 558g with full 10.1" screen Neuss, Germany, 1st September 2011 â€“ Toshiba Europe GmbH unveiled an exciting new product today â€“ the ultra-thin 25.7cm (10.1'') AT200 tablet. Despite measuring only 7.7mm from front to back, the Toshiba AT200 delivers a broad range of essential ports and interfaces. It offers an amazing wide-view display for comfortable content consumption plus full web browsing capabilities to meet the preferred usage for tablets. Every bit as powerful as it is stylish and robust, this tablet is built to exceed expectations. The Toshiba AT200 will be available in the fourth quarter of 2011 in Europe. Ultra-thin, ultra-powerful "The new ultra-thin 25.7cm (10.1") tablet Toshiba AT200, featuring Androidâ„¢ 3.2, Honeycomb, is the latest in a long line of Toshiba products that are masterfully engineered", said Marco Perino, General Manager DS Digital Products Division. "With a thickness of only 7.7mm and a weight of just 558g, the elegant Toshiba AT200 is highly mobile yet extremely smart and powerful." All essentials on-board To connect with other devices the ultra-slim tablet comes with all essential interfaces and ports onboard: amongst them micro-USB, micro-SD, Wi-Fiâ„¢ and BluetoothÂ®. The micro-HDMI Â®-port allows streaming HD content to the large screen of a TV. Front and back HD cameras are ideal for video conferencing and augmented reality applications. High-quality media consumption - no matter where you are The Toshiba AT200 allows users to enjoy videos at home and while out and about. It features a brilliant 25.7cm (10.1") high-definition screen that displays pictures with crisp colours and in full detail. Despite being ultra-thin, it allows up to eight hours of video consumption. Sound quality at its best To complement the first-class video capabilities the new Toshiba tablet with stereo speakers allows for a high quality sound playback. The Adaptive Sound Device Enhancer's sophisticated algorithm maximises sound quality to achieve a quality that normally only can be found with large speakers. Plus, a technology called Sound Masking Equalizer identifies and enhances sound that is being masked or distorted by surrounding noise. The result is a well- balanced, powerful playback of music and video sounds even under high ambient noise levels. Endless usage possibilities Toshiba's new tablet also offers a rich web browsing experience including support of AdobeÂ® FlashÂ® Player, access to more than 250,000 apps on Android Marketâ„¢ and Toshiba Places for endless possibilities.